Donizetti’s comic operas are true epicurean delights: delicious, satisfying, always enjoyable and almost as decadent as eating dessert first. 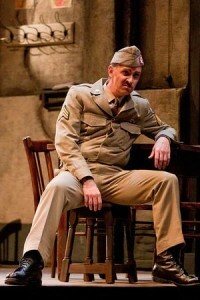 After years of performing “The Daughter of the Regiment” in the Met Opera pit, I never tire of its pleasures. 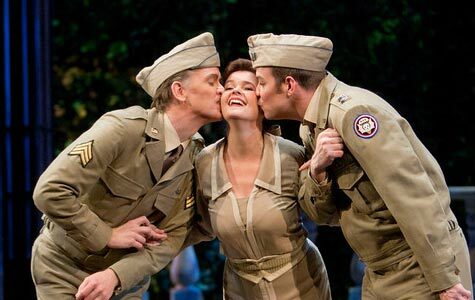 Whenever La Fille du Régiment is in the offing at an opera house, the infamous, challenging tenor aria with its nine high “Cs” usually comes to mind, but there is a great deal more to this delightful frolic. La Fille is filled with glorious music, and its infectious charm and wit make it easy to luxuriate in its excess of nineteenth-century guilty pleasures. Donizetti’s astonishing creative output is a constant source of amazement to me, in whatever language, including French. His years in Paris sufficiently empowered him to compose in this alien tongue, thus pleasing his French cohorts. The tradition of performing La Fille annually for the Fête de la Bastille would have come as no surprise to this composer, though I question the urban legend that “all the bars in France” would have been that familiar to him; he was too busy creating one brilliant aria after another. I often envision him as I have seen him pictured: at his desk, with a pen in each hand, his face reflecting a passion and commitment to limitless creativity. 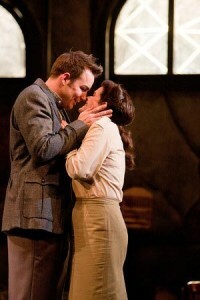 This San Diego Opera production originated with the Teatro Comunale di Bologna. My French husband objected to its departure from the traditional setting during the Napoleonic Wars to a post-WW II milieu. I also thought I would feel more comfortable with traditional surroundings, such as in the Met production I had been accustomed to, but I found the more contemporary situation in SDO’s rendering entirely believable. I am now convinced that, despite its adherence to the formulaic paradigm of the Romantic Comedy genre, the captivating bel canto melodies of La Fille du Régiment can be adapted to almost any military milieu or historical era. 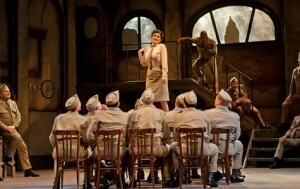 The youthful cast in this SDO production added to the opera’s charm. Slovakian soprano L’ubica Vargicová sparkled as Marie, the spirited “Daughter” of the title role. Her versatile instrument, capable of handling such diverse roles as the Queen of the Night, Lucia, and Gilda (her debut role here in 2009), was shown to great luster. Despite an occasional lack of focus in the mid-range, she was able to toss off the coloratura high notes with impressive adeptness, and her comic acting grabbed the attention admirably. Tenor Stephen Costello, a veteran of the Met, Vienna, Royal Opera and L.A. Opera, returned to San Diego as Marie’s true love Tonio. Having performed here in past seasons in Romeo and Juliet, Der Rosenkavalier and Faust, his reappearance was welcome. He handled the perennially challenging role nimbly, showing off the appealing brightness of his voice in the virtuosic Ah, Mes Amis. Understandably nervous, he soldiered on, nailing every high “C” with conviction, holding the final one in triumph. The audience, all of us on the edges of our seats, rewarded him with well-deserved applause and cheering. His touching second act aria, Pour me Rapprocher, was beautifully rendered as well. Despite his youth, American bass Kevin Burdette was convincing as a military “officer of a certain age” destined to kindle a romance with the Marquise. His opulent voice, which fit comfortably into this role, was a perfect compliment to his multifaceted characterization of Sulpice: tough and masculine, yet sympathetic and sweet, and always appropriately comical. In this impressive appearance, he shows a glimpse of sure potential success in his upcoming debut with the Met. San Diego Opera welcomes back Polish contralto Ewa Podleś for the first time since her opera debut here in Handel’s Giulio Cesare in 2006. Known for her stunning range and unique timbre, legendary in dramatic roles, Ms. Podleś took a comedic turn as the Marquise of Birkenfeld. With rare comic flair, she exploited the role to the hilt, both dramatically and vocally, emphasizing the importance of this pivotal character in driving the plot toward its inevitable happy end, and her clever quote from Carmen was an especially tasty amuse bouche. A powerful presence on the world’s stages, she demonstrated the versatility of a voice that has performed a wide divergence of roles at some of the greatest opera houses and symphony halls in the world. Carol Vaness, a mainstay of opera companies from the Met to San Francisco, debuted with San Diego Opera in 1991 in Mozart’s Così Fan Tutte and subsequently has appeared in Idomeneo and in the title role of Samuel Barber’s Vanessa. Well known for her signature depiction of Vitellia in La Clemenza di Tito, it was refreshing to see her bring the speaking role of the Duchess of Krakenthorp to life with such aplomb, and a delightful surprise to hear her sing, if only briefly. Malcolm MacKenzie’s comic turn as Hortensio was entertaining in its humor without being too over the top. Charles Prestinari’s chorus sounded superb as always. Yves Abel, principal guest conductor at Deutsche Oper Berlin since 2005 for the past several years and a regular guest with Vienna Staatsoper, has conducted a wide variety of comic and grand opera at the world’s grandest houses. In his San Diego Opera debut, the maestro effectively maintained forward momentum throughout the evening. I know from experience how technically difficult it is to play the deceptively simple overture. I admired Maestro Abel’s ability to coax sweet sounds from the orchestra yet still keep the pacing lively. Emilio Sagi’s direction brings a blend of opera and theater sensibilities from vast experience on several continents to this production, the characters playing off each other with appealing deftness, exploiting comic exaggeration to the hilt in a combination of wit, humor and self-parody without diminishing the poignant aspects of the story. Tonio’s bicycle crash and subsequent limping appearance were charming touches, while the hysterically funny introductions of the guests in Act 2 as “local royalty” provided nonstop laughs for the delighted audience. Julio Galan’s set design played up the contrast between the somber atmosphere of the bombed-out bar in Act One and the brightness of the Marquise’s drawing room in the second act. His military costumes were meticulous in their detail, down to the patches on the soldiers’ hats. Marie Barrett’s lighting in Act Two beautifully captured the chateau’s elegance, with its subtle changes visible through the French doors symbolizing Marie’s gradual loss of hope in her situation. All in all I can hardly imagine a more entertaining evening. I counsel you to give in to the appeal of La Fille’s temptations. Indulge in its sensual delights. Bask in its melodic pleasures.